For the past few years, smart grids have been the main topic of fervent research and development at both industrial and academic level. The smart grid is envisaged to be the next generation electric grid for Smart Cities. It enables the smart integration of conventional power generation, renewable generation, distributed generation, energy storage, transmission, distribution and demand management. The benefits of smart grid include the enhanced reliability and resilience, higher intelligence and optimized control, decentralized operation, higher operational efficiency, more efficient demand management, and better power quality. However, all these prospected transformations also bring with them numerous challenges and opportunities. We warmly invite you to participate in the ICSGSC 2019 program and activities and we are confident that you will find the program enriching, enlightening and rewarding. Proceedings:All submissions will be peer reviewed, and the accepted papers will be published in the ICSGSC 2019 conference Proceedings, which will be reviewed by IEEE publication program and be submitted for inclusion into IEEE Xplore, Ei Compendex and Scopus. 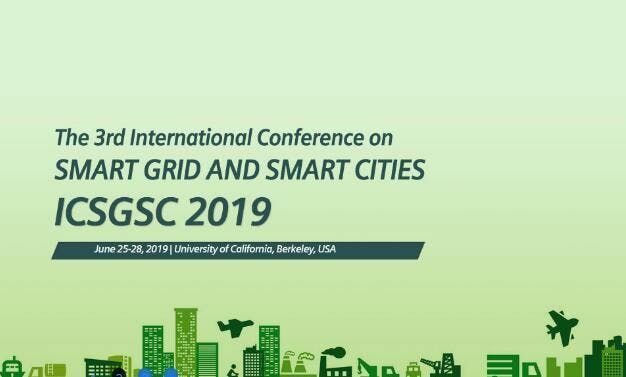 HistoryICSGSC 2018 - IEEE ISBN: 978-1-5386-8101-5 2nd International Conference on Smart Grid and Smart Cities (ICSGSC 2018) was successfully held in University of Malaya, Malaysia during August 12-14, 2018. ICSGSC 2017 - IEEE ISBN: 978-1-5386-0503-52017 International Conference on Smart Grid and Smart Cities (ICSGSC 2017) was successfully held in Nanyang Technological University, Singapore during July 23-26, 2017. Call for Papers*Smart Sensors and Advanced Metering Infrastructure*Power and Energy System Applications (generation, transmission, distribution, markets, operations, planning)*Impact of Smart Grid on Distributed Energy Resources (electric cars, demand response, distributed generation, storage)*Energy Management Systems*Intelligent urbanism*Smart city*Platforms and technologies*Smart city roadmap*Environmental sustainability*Heritage conservation*Appropriate technology*Infrastructure-efficiency*Placemaking*Social access*Transit-oriented development*Regional integration*Human scale*Institutional integrityetc.